This hot-stove season’s 3rd base free agent pool has already been the subject of much debate, thanks to one Alexander Emmanuel Rodriguez. Then there’s the other premiere free agent third baseman on the market—one Michael Averett Lowell, better known as Mike. And after that, well, we have…the rest. All of them, coincidentally (or maybe not coincidentally, come to think of it) hail from the National League, and most are light-hitting utility infielder-types in their thirties. Yikes. Teams who don’t have a great 3B under contract already and who don’t win the A-Rod/Mike Lowell sweepstakes may well be SOL. Jeff Cirillo of Arizona These days, he’s another mid-200’s hitter with good defense, but approaching old-as-hills status at 38. Aaron (Bleepin’) Boone of Florida Last season, he spent more time at first, and more time on the DL, but provided he can stay healthy he could probably move back across the diamond with little difficulty (if “little difficulty” means “the same high error totals we’ve come to expect from Aaron Bleepin’ Boone”). He can still hit, but his power has been gone since the steroids crackdown. One day, Tim Wakefield will find him where he sleeps. Mike Lamb of Houston Not a bad option—he hit .289 this season with a .366 OBP. No great shakes, defensively. 32 years old. 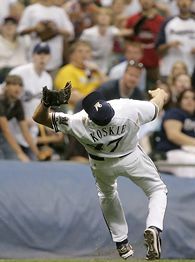 Corey Koskie of Milwaukee Didn’t play this year after suffering a concussion on the field in 2006. The Brewers declined to exercise his 2008 option, as their hot corner will be anchored for the foreseeable future by Rookie of the Year candidate Ryan Braun. If he can make a comeback, he’ll still be a bottom-of-the-order type guy. Plus, he’s 34 already. Theoretically, he could work as a defensive replacement. Alas, this is complicated by the fact that he’s never really played any position except third. I’m guessing the Brewers are planning on making Braun take grounders 6 days a week for the next four months. He could well end up a non-roster invitee. Abraham Nunez of Philadelphia Great defensive range, but another light-hitting 31-year-old. Russell Branyan of St. Louis Strikes out three times as much as he walks and finished the season hitting under the Mendoza line. 31 years old. Defensively, more of a utilityman than a real third baseman. Pedro Feliz of San Francisco Of third basemen with enough at-bats to qualify, this guy was last in the majors in OBP. However, he’s among the top 5 in defenisve ability. 32 years old. Tony Batista of Washington Another mediocre utility infielder in his mid-30s who hits in the mid-.200s. Yawn. Geoff Blum of San Diego Ditto, but better on defense. Other potential targets for the Yankees could be the Rangers’ Hank Blalock, the Mariners’ Adrian Beltre, the White Sox’s Joe Crede (who is coming off back surgery) and the Reds’ Edwin Encarnacion. Blalock, who will turn 27 next month, missed most of 2007 because of surgery to remove a rib (thoracic outlet syndrome). He batted .293 with 33 RBIs in 58 games. He has one year and $5.95 million left on his contract, plus a team option for 2009. Crede, 29, had a terrible season, batting .216 with four homers and 22 RBIs in 47 games, but he hit 30 homers and knocked in 94 runs in 2006. Beltre, 28, has two years left on his five-year, $64-million contract. He hit .276 with 26 homers and 99 RBIs this year. Encarnacion, 24, hit .289 with 76 RBIs and is arbitration-eligible. I think Crede will be trade bait, since Josh Phelps has emerged as a capable replacement, and it wouldn’t surprise me if the Sox, Yankees, Phillies or another team trades for him. Yeah, I didn’t go into the possible trades. I think it’s clear that anyone with a 3B to spare should be dangling him out there for a trade after A-Rod and Lowell sign. Because this crop of free agents isn’t exactly giving anyone goosebumps. Well, not the good kind, anyway. Re: Abe Nunez – his nickname over on Beerleaguer blog was ‘No-hit’ [Nunez]. Light-hitting would be putting it.. lightly. Joe, indeed, how many different ways is there to say, “Couldn’t hit the pavement if he tripped”? @Jojo, indeed, Josh Fields is the 3B everyone wishes they had right now (well, except the Mets and the Marlins). Cheap, young, and he hits for power (if not quite for average). One thing to keep an eye on in the 3rd base market is what the Dodgers do. They have Nomar on the books for 2008. They may make a play for A-Rod. But what about prospect Andy LaRoche? Will Torre use him? If not, he might be available. Can Nomar even play third at this point? I feel like he might dive for a liner and smash into a hundred little shards of Nominess. Well, no, not really. At least not well. He split time at 3rd and 1st last year, I think. And I think before he got hurt and shut it down in September, he was still playing third. But I have no idea if Torre is thinking the same thing. The Dodgers resigned Nomar to a two-year deal last winter to play first base, completely blocking their best hitting prospect James Loney, but Nomar OPS’d about .625 for four months, and meanwhile Wilson Betemit was battling it out with the Mendoza line, so finally the Dodgers shifted Nomar to third, shipped Betemit to the Yanks for Proctor, and handed Loney the job at first where he proceeded to bat about .335 and OPS over .900.